ADAS Archives - Touch Display Research, Inc.
Magneti Marelli is an automotive tier-one system supplier headquartered in Italy. It was founded 100 years ago in 1919 with business focusing on automotive, telecommunication, and other areas. Magneti Marelli currently has approximately 44,000 employees with 8.2 Billion Euro revenue in 2017. In 2018, Magneti Marelli invested in LeddarTech for solid state LiDAR technology. 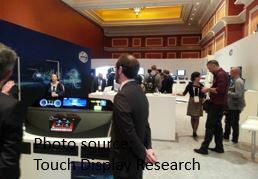 At CES 2019, Touch Display Research was invited and met Magneti Marelli at their suite at Wynn hotel and saw their newest demos. We met with Magneti Marelli’s Head of Marketing and Communications—Ms. Lisa Van Giesen, and their Electronic R&D Manager–Mr. Daniel Oliveira—who is based in China and in charge of their business serving Chinese automotive brands. We also met with Magneti Marelli’s Director of Program Management–Mr. Scott Shultz—who is based in Michigan, U.S.A. and in charge of their business in the U.S. market. 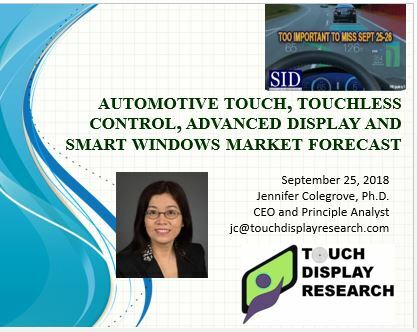 In the “Automotive touch, display, ADAS and touchless HMI 2018 report, second edition” Touch Display Research Inc. analyzed automotive touch screen, display, ADAS (Advanced Driver Assistant System), and touchless human-machine-interaction (HMI) technologies and supply chain. More than 500 companies working on automotive technologies are profiled in the report. The automotive touch screen, display, ADAS and material supply chain is evolving. How to prepare your company to benefit, not loose from this new trend? 9 strategies to benefit from this automotive supply chain change are provided in this report. What is Magneti Marelli’s new technologies and strategy for 2019 and beyond? All these are covered in the recently published Touch and Emerging Display monthly report. This entry was posted in ADAS, automotive, Displays, Flexible curved display, Touch screens and tagged ADAS, automotive, automotive ADAS, automotive display, automotive market, automotive touch screen, Daniel Oliveira, Lisa Van Giesen, Magneti Marelli, Scott Shultz on January 30, 2019 by jennycolegrove. September 29, 2018, by Jennifer Colegrove Ph.D. Principal Analyst, Touch Display Research Inc. 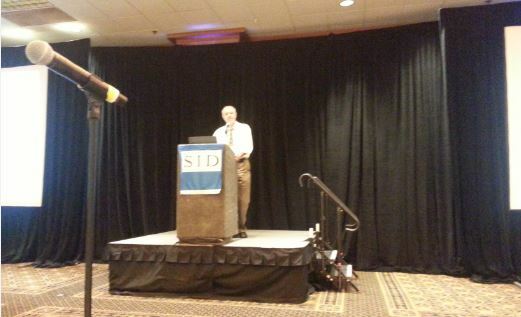 I just returned from the SID Vehicle Display and Interface 2018 conference in Detroit, Michigan. It was my honor to meet some of you in person. Mr. Silviu Pala, co-chair of this conference, and CEO of Automotive Display, gave a summary presentation of the 25th years history of this Vehicle Display conference. 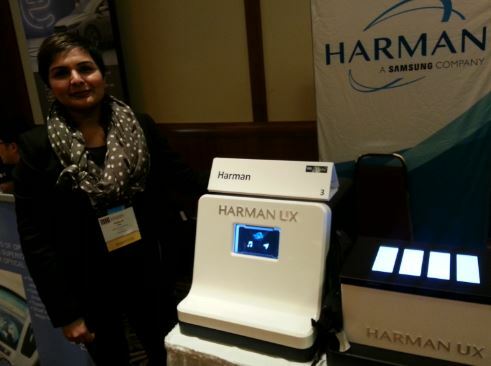 At this conference, Harman (acquired by Samsung) showcased its advanced touch screen, quantum dot display, and AMOLED display technologies for automotive market. I had a briefing with Ms. Rashmi Rao, Senior Director of Harman about their demonstration and future roadmap. 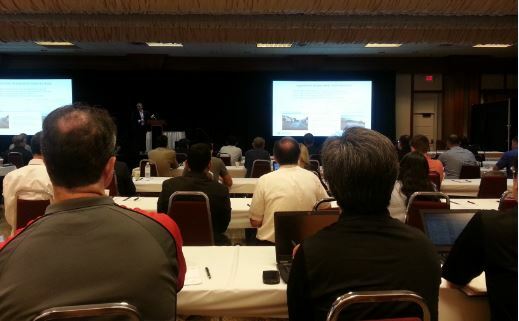 On behalf of Touch Display Research, I gave a presentation on Automotive Market’s New Opportunities for Touch Screen, Displays, ADAS, Touchless Control, and Smart Windows. More detail about the conference review and market forecast can be found in the upcoming Automotive Touch Display ADAS Technologies and Market Forecast 2018 report. Touch Display Research, Inc. (https://TouchDisplayResearch.com) is a technology market research and consulting firm specializing in touch screen and emerging display technologies such as OLED displays, quantum dots, flexible displays, e-paper displays, ITO-replacement, Active pen, near-eye displays, smart windows, gesture controls, voice controls, and eye controls. Touch Display Research helps technology companies grow and connecting their technologies to the marketplace. We have been writing about OLED industry for over 10 years. We were the first company to publish Quantum Dot market reports. We were the first company to publish Active Pen market report, and ITO-replacement market report. We have always been there to analyze new and emerging technologies. Touch Display Research provides reports, consulting, and due diligence to touch suppliers, display manufacturers, consumer electronics ODMs/OEMs, material suppliers, investors and venture capitalists. We are member of Flextech Alliance, SEMI and SID. This entry was posted in ADAS, AMOLED, anti fingerprint, anti smudge, artificial intelligence, automotive, Conference Review, Displays, Flexible curved display, Flexible display ecosystem, Flexible display market, Flexible OLED, Flexible touch screen, Gesture control, ITO replacement, metal mesh, micro LED, micro LED display, micro LED market report, micro LED report, microdisplay, Mini LED, OLED, QLED, Quantum dot, Quantum dot market forecast, Silver nanowire, Smart Windows, touch screen, Touch screens, touchless control, touchless HMI and tagged automotive display, Harman, Rashmi Rao, Samsung, SID, Silviu Pala, touch display research, Vehicle Display 2018, Vehicle Display and interface on September 29, 2018 by jennycolegrove. Today France-based Valeo just announced it acquired 100% shares of gestigon, a German start up that is specialize in touchless HMI (human machine interface). The terms is not disclosed. The automotive industry’s adoption of new technologies has accelerated in the past couples of years. More and more touch screens and displays are integrated in the automobiles for better infotainment, intuitive control, and safety. ADAS (Advanced Driver Assistant Systems) and touchless human-machine-interaction have saved lives. 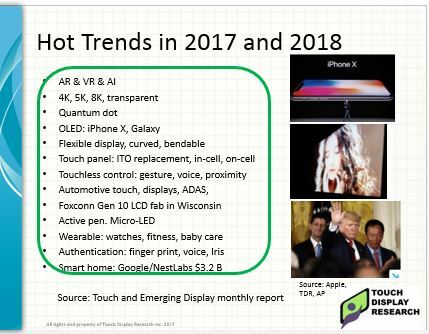 Touch Display Research forecasts the overall automotive touch, display, ADAS and touchless HMI market will grow from $15 billion in 2017, to $60 billion in 2023. 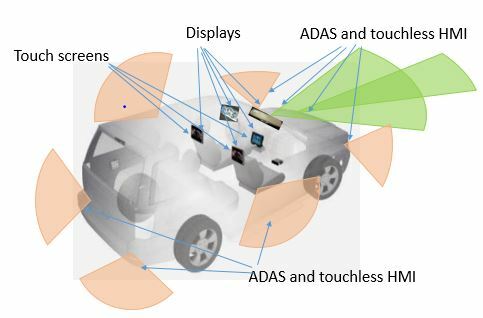 In the recently published “Automotive touch, display, ADAS and touchless HMI 2016 report,” Touch Display Research Inc., a market research and consulting firm, analyzes automotive touch screen, display, ADAS (Advanced Driver Assistant System), and touchless human-machine-interaction (HMI). More than 500 companies working on automotive technologies are profiled in the report, which includes over 100 automotive companies, over 200 touch screen companies, over 200 touchless human-machine-interaction (HMI) companies and about 30 display companies. 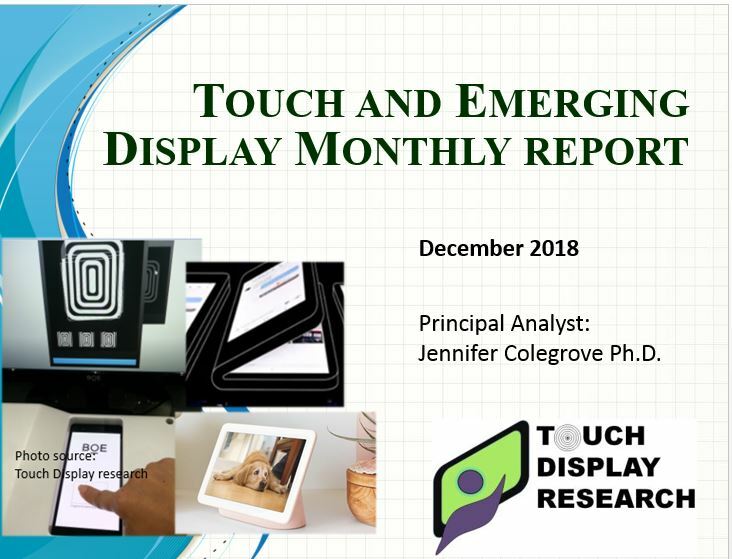 Dr. Colegrove, author of this report, has conducted many first-hand survey and interviews of touch panel suppliers, display suppliers, touchless sensor suppliers, automotive system integrators, automotive brand companies in the past several years. Touch Display Research, Inc. (www.TouchDisplayResearch.com) is a technology market research and consulting firm specializing in touch screen, emerging display and sensor technologies such as OLED displays, OLED lighting, flexible displays, e-paper displays, ITO-replacement, Active pen, near-eye displays, quantum dots, gesture controls, voice controls, eye controls and automotive HMI technologies. Touch Display Research provides standard reports, consulting projects, and due diligence for touch suppliers, display manufacturers, consumer electronics ODMs/OEMs, material suppliers, investor companies, venture capitalists, and companies who are merging or acquiring companies in the touch screen, display, materials and sensor industry. We are member of FlexTech Alliance, SEMI and SID. This entry was posted in ADAS, artificial intelligence, automotive, Displays, Gesture control, touchless control, touchless HMI and tagged acquire, automotive, automotive market, gestigon, Intel, Mobileye, touchless HMI, touchless HMI market, Valeo on March 13, 2017 by jennycolegrove. This week, Tesla announced that all Tesla vehicles produced in their factory – including Model 3 – will have the improved sensors for full self-driving capability. Beginning with vehicles manufactured in late 2014, all new Tesla Model S vehicles come equipped with a camera mounted at the top of the windshield, forward looking radar, and ultrasonic sensors in the front and rear bumpers. Triggered by the deadly accident in this May, Tesla’s CEO, Mr. Elon Musk, indicated that Tesla will update the Autopilot in end of September/early October to Autopilot 8.0. They’ll change the camera-as-the-primary-technology ADAS (Advanced Driver Assistant System) to radar-as-the-primary-technology ADAS. Touch Display Research believes Tesla’s radar-as-the-primary ADAS still needs camera in it, since radar can’t detect the traffic light color, nor pained lines for lanes. Camera is still necessary in the ADAS. This week, Tesla announced they’ll integrate more than 21 sensors for their cars: 8 surround cameras provide 360 degree visibility around the car. 12 updated ultrasonic sensors complement this vision, allowing for detection of both hard and soft objects. A forward-facing radar with enhanced processing capable of seeing through heavy rain, fog, dust and even the car ahead. To process all the data collected from the 21 sensors, Tesla also upgraded their new onboard computer with more than 40 times the computing power of the previous generation. The automotive industry’s adoption of new technologies has accelerated in the past couples of years. ADAS (Advanced Driver Assistant Systems) includes many features. The top 3 most popular/critical features are automatic emergency braking, pre-collision warning, and blind-spot warning. 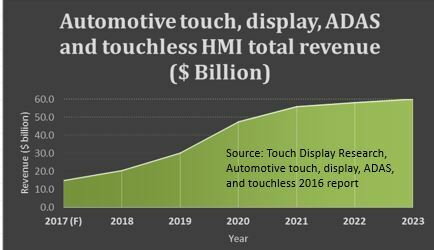 Touch Display Research forecasts the overall automotive touch, display, ADAS and touchless HMI market will grow from $15 billion in 2017, to $60 billion in 2023. Currently ADAS feature is optional in many high-end cars, and we believe it will quickly become a must for many new buyer. By 2022, ADAS will become standard in most American cars. The $60 billion opportunity will be gobbled by over 500 companies, which include approximately 100 automotive companies, approximately 200 touch screen companies, over 200 touchless human-machine-interaction (HMI) companies and approximately 30 display companies. This entry was posted in ADAS, automotive, Displays and tagged ADAS, Advanced Driver Assistant Systems, automotive, camera, radar, self-driving, sensors, Tesla, Tesla Motors, ultrasound on October 20, 2016 by jennycolegrove.